Phoebe Ann Cummings is the daughter of Ebenezer Cummings and Jane Harris. She was born in Nov 1835/1836 in Three Rivers, Quebec, Canada. She died in 1909 at age 74 in Council Grove, Morris, Kansas. She is buried at Chalk Mound, Wabaunsee, Kansas. In about 1850, she married (1) Mr. West. 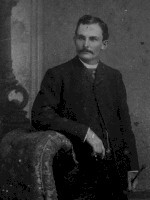 Uell Millison was born about 1862 in Kansas. He married Ida. Alpha Alexander Millison was born in 1865 in Kansas. He died in 1948 at age 83 in Emporia, Lyon, Kansas and is buried at Chalk Mound, Wabaunsee, Kansas. Charles Uba Millison was born 14 Apr 1868 in Council Grove, Morris, Kansas. Orra A. Millison was born about Jun 1870 in Council Grove, Morris, Kansas. Alex: Birth and Death from his gravemarker. Phoebe: Birthdate from the 1900 census (Rock Creek, Wabaunsee, KS., p. 180), which lists 1835 and her gravemarker, which lists 1836..
Uell & Alpha: Births from the 1870 census (Council Grove, Morris, KS., p. 8). See also Alpha's gravemarker. Phoebe: 1850 Census. Goodfarm, Grundy, Illinois. 1870 Census. Council Grove, Morris, Kansas. Page 8. 1900 Census. Rock Creek, Wabaunsee, Kansas. Page 180. 1910 Census. Rock Creek, Wabaunsee, Kansas. Page 4.